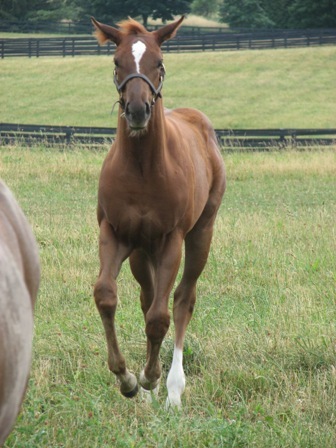 As was discussed on my previous guest blog, there is little that matches the excitement and anticipation of a foaling. For the attendants, the moment is filled with hope; hope that this foal, out of about 35,000 Thoroughbreds born in North America each year, may be “the one”-- that special horse that could parlay centuries of impeccable ancestry into a win in one of the world’s greatest races. Underlying this anticipation is a different kind of hope. Hope that the newborn at hand will overcome the environmental odds stacked against him and emerge a healthy horse, and that the new mother will be able to pull through the tumultuous event of birth. Not every mare and foal are as lucky as those we see frolicking in Bluegrass fields each spring, and when a situation arises that leaves a foal motherless, owners often turn to nurse mares. Nurse mares are horses that act as surrogate mothers to raise the foal until it is weaned. These mares are typically not Thoroughbreds, but Quarter Horses, Paints, or mixed breeds that are leased out to raise orphans deemed more valuable than the biological foal they have produced. Some of racing’s top stars have been reared by nurse mares, including champions and Preakness Stakes (gr. 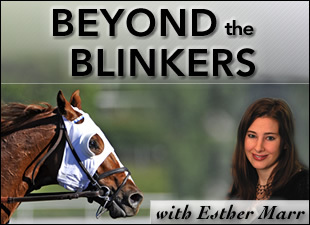 I) winners Rachel Alexandra and Afleet Alex. The use of nurse mares is undoubtedly one of the most controversial practices in the Thoroughbred breeding industry. I do not, however, intend to delve into these politics here. My wish is to highlight the amazing work these mares do, whether one agrees with their use or not. In a desperate situation, nurse mares defy their natural instincts, accepting a foreign foal and protecting someone’s valuable asset. Nurse mares are heroes. In April 2007, I met a true hero. 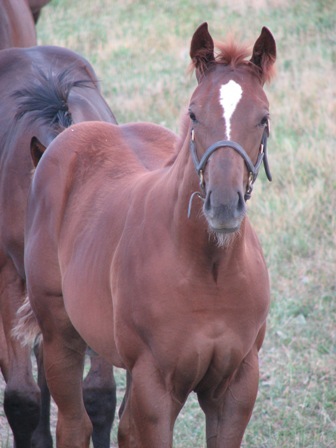 It happened about three weeks after the birth of a striking chestnut filly at the breeding farm I was working on. The daughter of a perennial leading sire out of a grade II winner and champion producer, “Katie” was arguably the most valuable foal our small scale operation would produce that year. 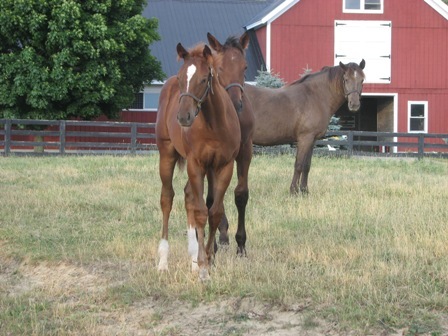 At two weeks of age, Katie fractured her left hind leg while running in the paddock with her dam. While non- life threatening, the injury would isolate Katie to her stall for six months. This schedule did not fit Katie’s mom, who needed to travel to Kentucky to be bred. The nurse mare was on her way. As sometimes happens, the first try was not meant to be. The big, boxy Standardbred mare we were paired with refused to accept Katie, and despite 15 all-night vigils with the pair encouraging them to bond, our efforts proved fruitless. Just as we were reaching our wits end, a call came from a nearby farm. There was a nurse mare available, and she was being offered to us. With nothing to lose, we said yes, and upon bringing her home we knew we were right. What we still didn’t know was how the roan Kentucky mountain horse nurse mare named Goldie would impact our lives. I’ve heard the theory that if the nurse mare does not accept the foal within 24 hours, they will not accept it at all. With Goldie, the connection was instant. Before our story continues, here is a bit of history on Goldie. She is one of two or three nurse mares kept annually at the Ontario, Canada-based Sam Son Farm, one of North America’s leading breeders. The operation campaigned grade I winner Smart Strike, now a two-time leading sire, as well as the late Canadian Horse of the Year and champion broodmare Dance Smartly. Sam Son had acquired Goldie a few years previously from John Sikura’s Hill ‘n’ Dale Farm near Lexington, but had not yet had to use her as a nurse mare. Katie was her first test, and she passed with ease. For the next two months, Katie and Goldie lounged the days away in their stall, happily watching the other mares and foals move in and out and soaking up the sunlight that peeked through the windows. Goldie was not much for humans; it took us many tries and a lot of carrots before we could effectively scratch her neck or adjust her halter. Goldie was not adept to human contact, but she loved her baby. We tried to reward Goldie for being a good mother by letting her go outside on her own for 15 minutes a day, but to no avail: she would simply go into panic mode when Katie was out of sight, and would not be happy until she was returned to her little filly. So house arrest it was. As spring melted into summer and Katie and Goldie both packed on the pounds, the time came for Katie to begin testing her healing limb. This meant hand walking twice a day, beginning with exploring the barn aisle and progressing to long strolls around the driveways and paths of the farm. But not without Goldie. So off we went, twice daily, exploring every nook and cranny of the farm on our quest for exercise. By this time, Katie had developed quite a standout personality. She was comical and cocky, yet charming. I can only imagine what it must have looked like--me, a comparatively weak human, attempting to restrain a bouncing, bolting baby while dragging a shaggy, cellulite-covered nurse mare in tow. With routine checkups indicating progress, Katie and Goldie were allowed to be turned out by August, and by September, they joined the herd of 12 others mares and foals. In October, the unlikely pair were weaned, Katie jumped on a van to South Carolina for the winter, and Goldie headed home to prepare to have her next foal. It would be seven months until I would see Katie again, but she returned to Canada in May 2008 bubbling with personality. Katie was always the first filly to approach when you entered the paddock, immediately raising her head and marching up to you as soon as she caught wind of your presence. Even as a writer, I cannot find the words to appropriately describe the aura Katie carried with her. She was like a queen with grace: she treated herself like royalty, but treated her humans like her best friends. I spent each day that summer grooming and caring for Katie, and by August I was breaking her. Not surprisingly, she was a quick learner. Goldie must have taught her well. Just two weeks after introducing the tack, I rode Katie in the paddock for the first time. We romped around the paddock, walking, trotting, and cantering circles and figure-eights. It was so perfect that I couldn’t help but feel as if this was the only thing either of us was ever meant to do. Perhaps I was right. The next day Katie went off her grain. Two weeks later, she died. While the reasons for her death were never completely conclusive, it was believed that she suffered from a neurological illness. Two years and many miles later, I look back on the time I had with Katie and there are some specific things I remember: Exploring the farm with her as a foal; Riding her around the paddock as a yearling; Sitting with her helplessly in the stall in the days before her death, praying that my grief alone could be enough for someone to decide that she didn’t have to die. The time I had with her was limited, but the little time I had was because of Goldie. In a recent phone conversation with Sam Son Farm manager Dave Whitford, I learned that Goldie is still with Sam Son and doing well. She raised an Afleet Alex Thoroughbred foal last year, and is due to foal again any day to a Warmblood stallion, a mating that was planned by a Sam Son employee. Katie’s biological mother produced a full sister to Katie the following April, a little bay who is currently winter training in South Carolina with hopes to race in 2010. After being barren for 2009, Katie’s mother is currently in foal with another full sibling. While this is proof there is reason to look forward to the future, it is also proof that legacies live on, and I will forever have the fond memories of the little chestnut filly with the shaggy roan nurse mare.